Recently I've been thinking it's about time I tell a little more about myself. If you hadn't noticed, I've introduced myself here as Shinobu. But if you're one of my Australian friends, you might know me as Jane. Shinobu is my Japanese name. Jane is my English name. I'll tell you a little story about it...and about growing up half Japanese in Australia♡ I hope you get a laugh out of it! I guess the story started many years ago when my mother was in high school. My mother's friend sometimes told me about the old days and what my mother (nicknamed: Nonchan) was like when she was young. Once she told me that Nonchan picked out her children's names when she was in high school, and that Shinobu was one of them. Little did Nonchan know, that years later she'd be marrying a foreigner and living in Australia! So my father chose an English name for me, and my mother gave me my Japanese name. 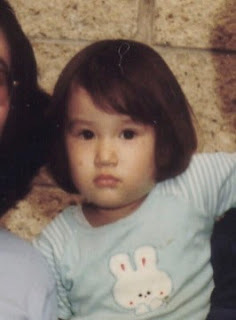 When I was small, sometimes my mother called me "Shinobu-chan", but more often she'd call me "Jane" pronounced "Je-en" (Jen with a long "e" sound, as the English sounds of "Jane" don't exist in Japanese) or "Jen-Jen". We spoke English at home. With a Japanese accent. In first grade my mother wrote on my school books my name as: Jane Shinobu Surname. I was so embarrassed. Shinobu was such a strange name. No-one could even read or pronounce it. We lived in the country, and as far as I know, our primary school of 500-or-so had no Asian kids other than myself and my sisters. Let alone Japanese with strange names like "Shinobu"! The most embarrassing question was: "What's your middle name?" The first day of Junior High came, and the teacher called the roll. Half way through I hear the name: "Shinaboo". The class went silent. I shuddered in embarrassment - I knew it could only be me. Again, "Shinaboo". I quickly walked to her desk and tried to explain that my first name was really "Jane" and there must be a mix-up in my given names. For weeks classmates joked that I was under cover and that "Jane" was just a pretend name. I even got the nick-name "Secret Agent Shinaboo"! Finally I realised I couldn't keep it secret any longer. I might as well accept my name and be proud of it. Luckily we lived in the city now, so there were Asians and kids of all nationalities in my school. It was no longer a shame to be Japanese. 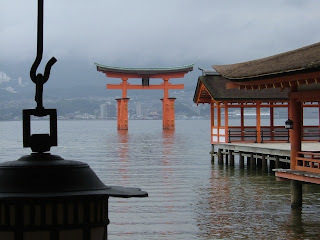 When I was seventeen, I visited Japan with my mother, for the first time in twelve years. I was blown away by the experience. Stepping into a tatami-floored room, breathing in and realising that the smell was so familiar (even though I hadn't experienced the smell since I was five years old); seeing Mt Fuji appear before my eyes as the mist cleared, and feeling that my ancestors had seen that same peak; my identity as a half-Japanese suddenly meant more to me than it ever had before. I fell completely in love with Japan, and from then on somewhere in my heart I knew that my destiny was in Japan. I felt the Yamato-Damashi. My ancestors were calling. But I couldn't speak Japanese. I had taken Japanese class in Junior High, but that only gave me a handful of sentences which didn't get me very far. When a Japanese person spoke I couldn't understand anything. I was incredibly lucky then, when at twenty-one years of age, I applied to serve a one and a half year volunteer mission for my church. I could have been called to serve in England, The United States or New Zealand, to name a few. But the call letter came in the mail, I opened it, and it read "Sendai, Japan". 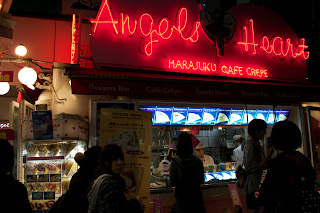 My mission in Japan was one of the most amazing experiences of my life. So many dear friends, so many precious memories. It was truly living the dream. And of course, most of my days for one-and-a-half years was spent talking to people. After I had finished the mission I couldn't stay away. Eighteen months later I was back living in Japan, this time working as an English teacher. While at work I was "Jane", but the rest of the time I was called "Shinobu-chan". 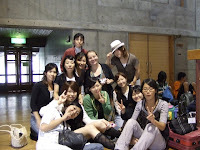 I was very involved with church activities, and of course all my friends there were Japanese. I really liked being called Shinobu, because it allowed people to see me as partly Japanese rather than just seeing me as a foreigner with a foreign name like "Jane". 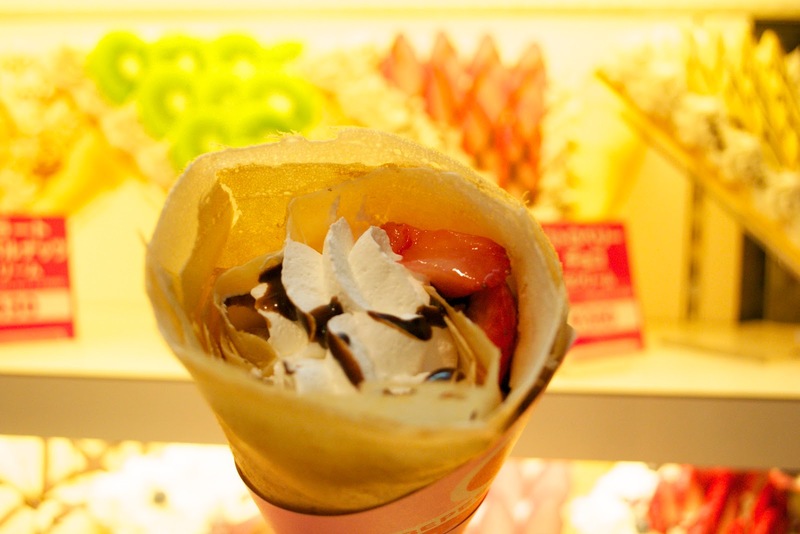 I had so much fun and made many friends all over Japan who know me as "Shinobu". I love Australia. 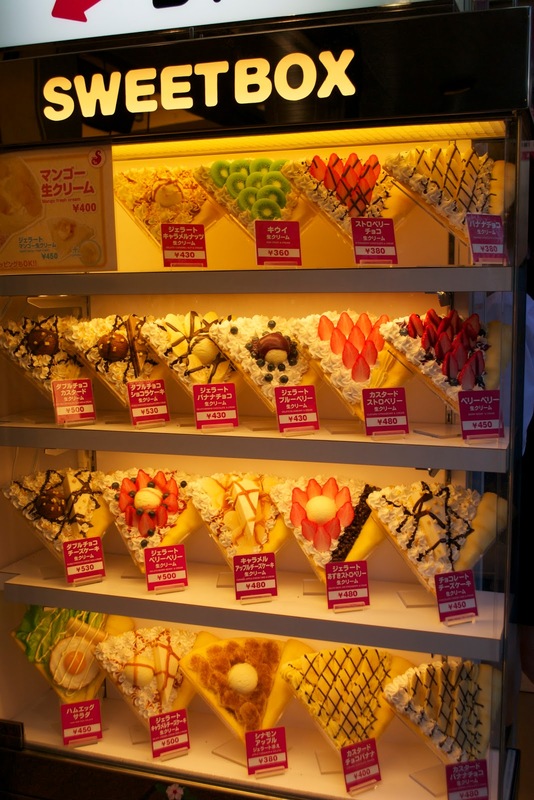 I love Japan. In Japan, I'm Shinobu. In Australia I'm Jane. 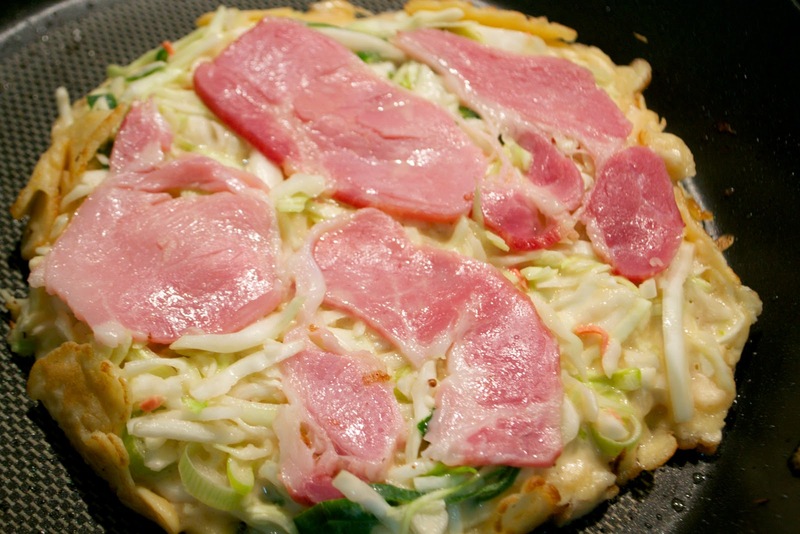 So quick and easy to make, Okonomiyaki has always been a favorite in our family.When I was a little kid we used to call it "okonomi-yummy"! This time I made it with bacon, however thinly sliced pork is the original version. 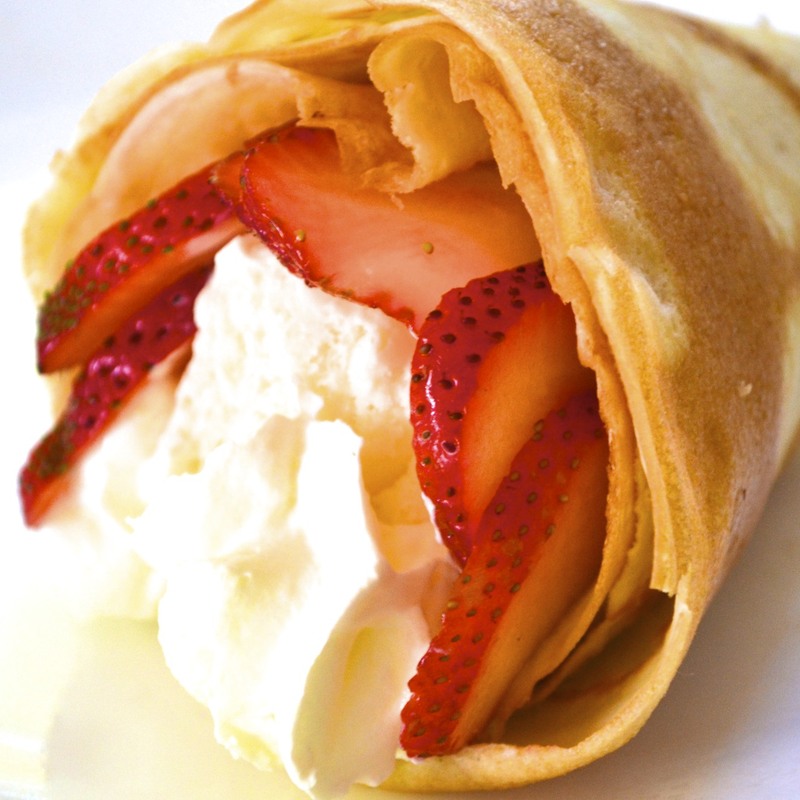 Scroll down past recipe to see more variations. 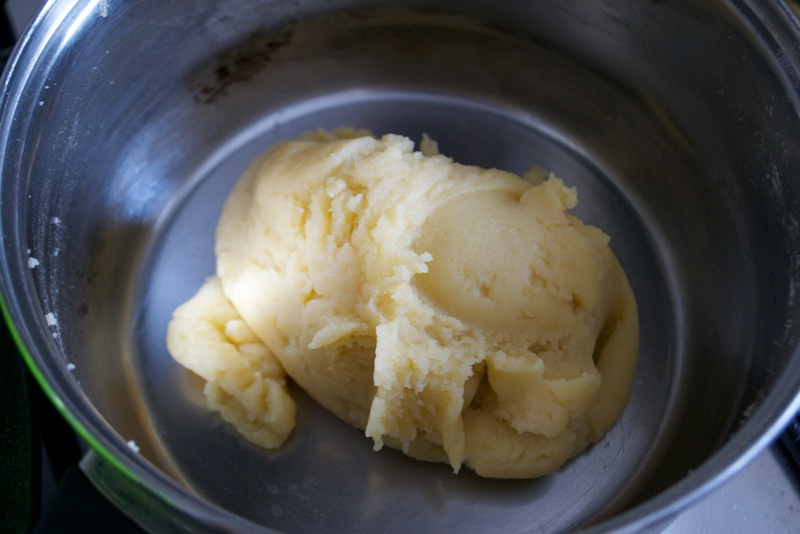 Mix flour, watereggs in a large mixing bowl. Mix in dashi, pickled ginger and some negi. Add cabbage and combine well. 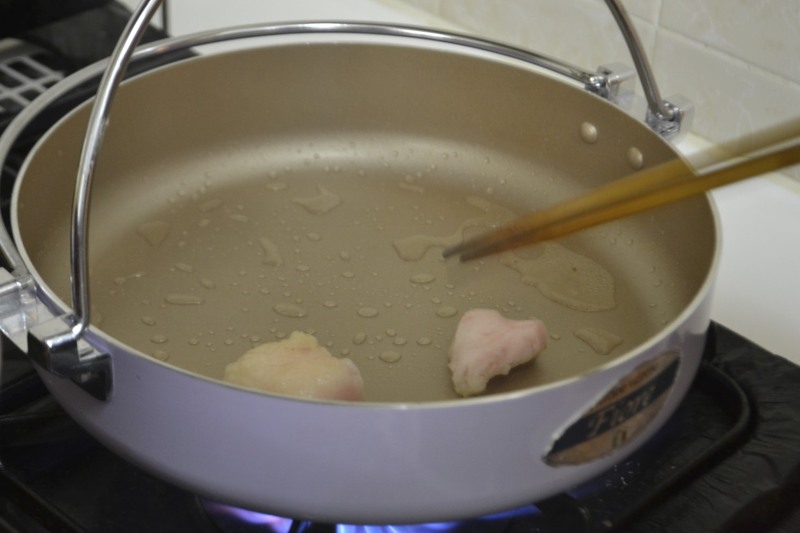 Heat a little oil in a frypan. 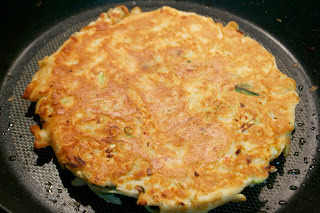 Spoon Cabbage into the frypan, to make a circle about 22cm(9in) across and 1.5cm(3/4in) thick. 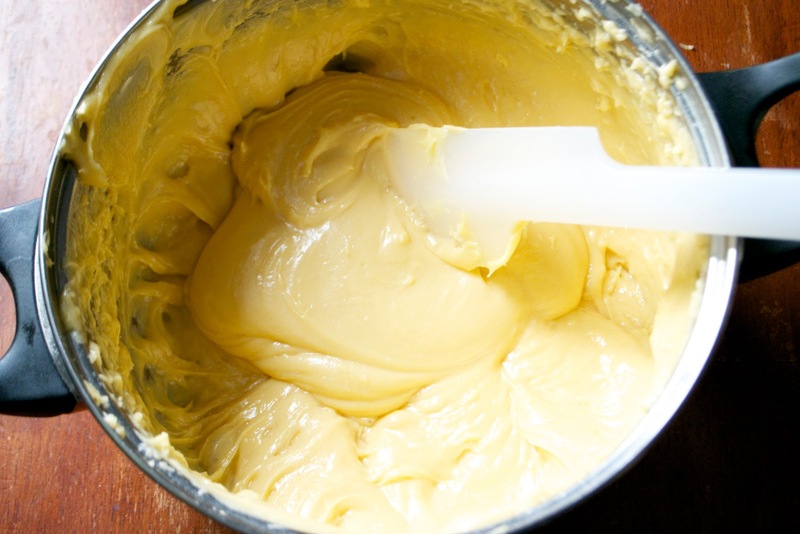 Make sure there's enough batter to hold it together. Neaten the edges by using a spatula to push in the edges and any cabbage or batter that's sticking out. Place thinly sliced pork on top (or bacon). Cook over med-low heat about 5 min. Flip, then cook another 3-5 min. When cooked through, turn onto a plate, meat side UP. Spread sauce generously on top. 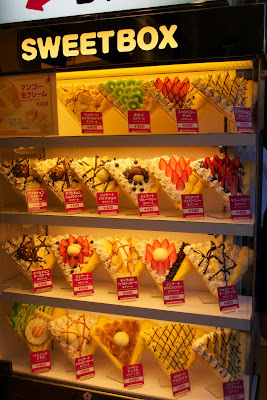 Decorate with Mayonnaise, Katsuobushi and Ao-nori. Cabbage, Eggs and only just enough flour to hold it together. 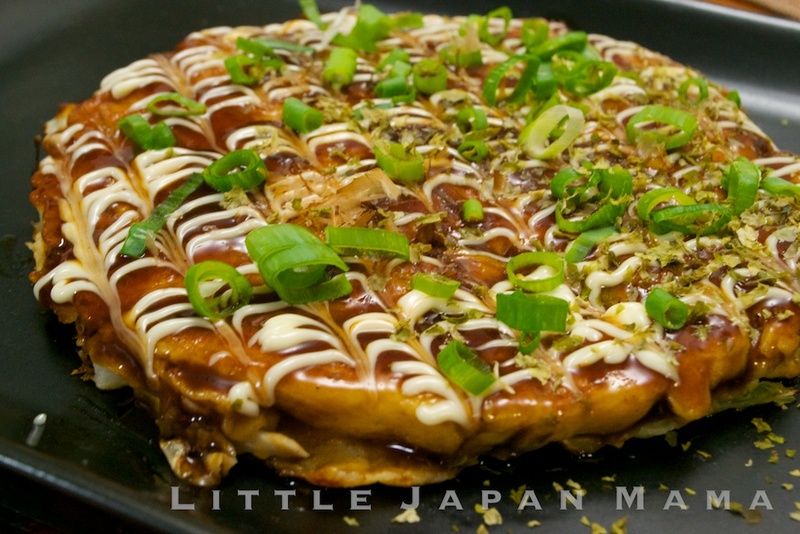 I don't know how anyone could call something Okonomiyaki if it doesn't have Okonomi (or Tonkatsu) sauce spread on top! 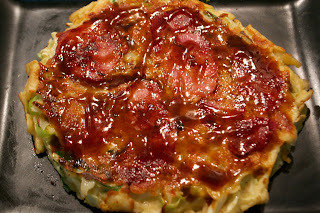 Modan-yaki Similar to Hiroshima-Yaki, but with the cabbage and batter mixed. 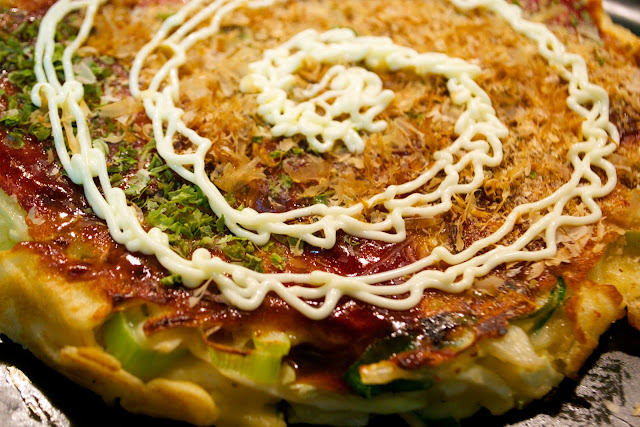 As long as you stick to my list of "Essential Ingredients of Okonomiyaki" I think you'll be pretty safe calling it okonomiyaki. Why do Beard Papa's cream puffs taste better in Japan than in Australia? I know the answer! 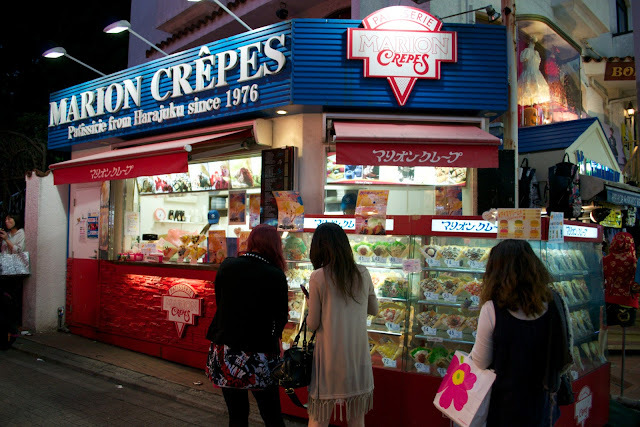 I was just walking past the local Beard Papa's store here in Brisbane, when I noticed that the store looked different to the stores I saw in Japan two weeks ago. 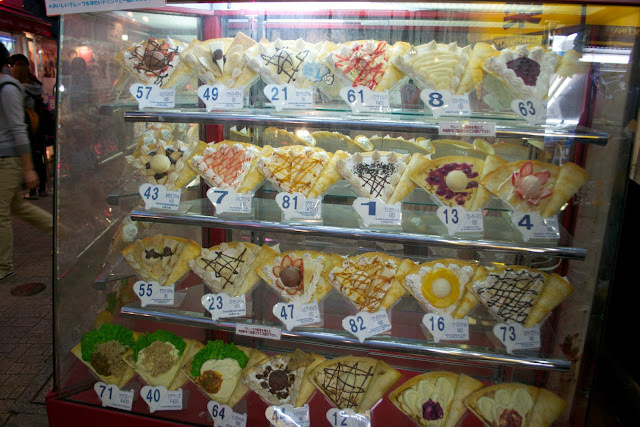 Where are those big oven-looking things where they keep all the cream puffs? In Australia the cream puffs were sitting cold in a display window, not an oven. 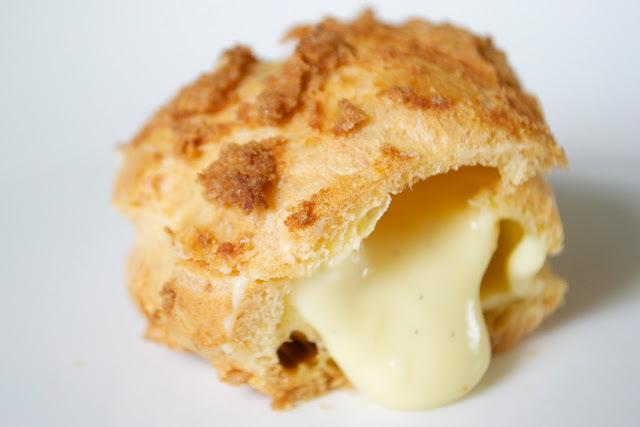 Leave the cream puffs in the oven at low temperature until you're just about to serve them! Maybe if you wanted to serve them 2 hours later you could leave them at 75 degrees C for longer? I haven't tried that yet so I can't say exactly. 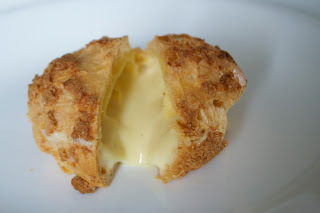 Anyway, I made cream puffs (again) today, this time as a special treat for my class of 12-13y.o. girls that I teach at church. 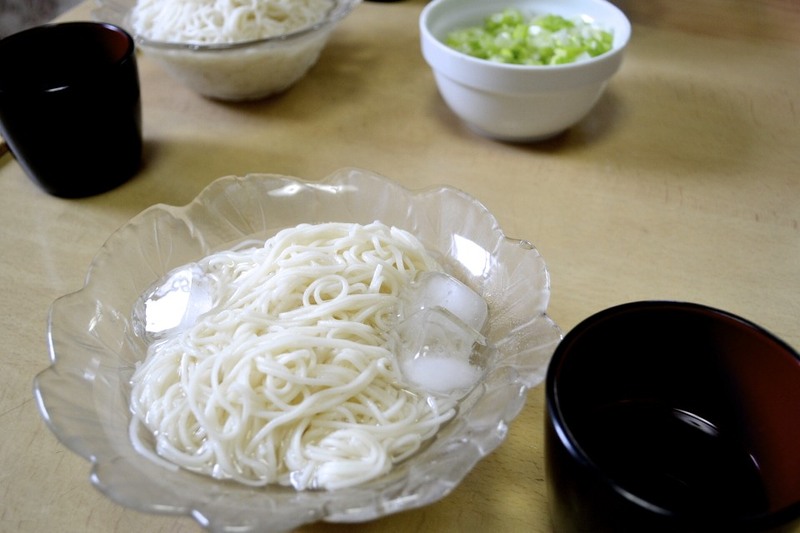 Tsuyu can be used for a dipping sauce for cold soba (zaru-soba) or somen noodles, and as an ingredient in many other Japanese dishes. 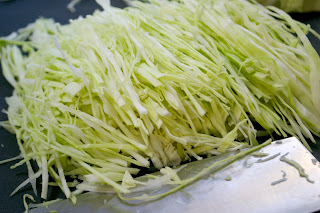 For using as a basic dipping sauce for zaru soba or somen, dilute 1 part tsuyu to 3 parts water. Place mirin, water, katsuo-bushi and konbu in a saucepan and bring to boil. Gently simmer for 5 min or so to evaporate the alcohol. Add shoyu and simmer 1 more minute. Allow to cool completely. This time allows the katsuobushi flavour to steep into the tsuyu. Pour through a sieve into a bottle and refrigerate. Keeps for months. The water is to make the concentration similar to shop-bought tsuyu, however you don't really need to add it, if you want to save fridge space. Just remember when using that it will be more concentrated. Shop-bought tsuyu also contains sugar, so if you prefer sweeter tsuyu, you can add 1 Tbsp sugar to step 1. By the way, did you know Sukiyaki is SO EASY it's just 3 steps? Step 1: fry beef fat to grease the pan. Add sauce. Step 3: Add shungiku. It's now time to eat! Shungiku: Fill a bowl with water in the sink. Submerge shungiku, dunking well. (this also freshens them) cut into 3-4 inch lengths. Place cooking equipment on the table. Set out egg bowls and rice bowls and chopsticks for each person. Each person whisks their egg with chopsticks and waits in anticipation. 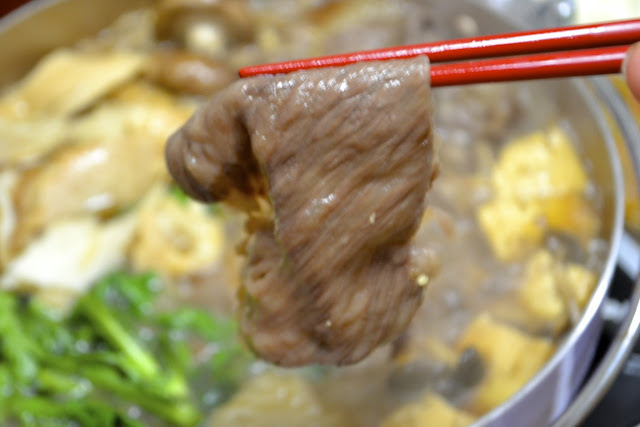 Heat Sukiyaki Pan and fry beef fat to grease the pan. Add sauce ingredients (or 2/3 of a bottle of sauce) and a dash of sake. 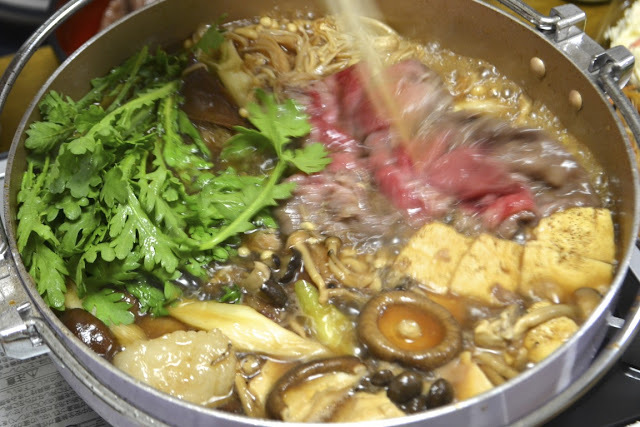 Add some of each ingredient (beef, tofu and vegetables *except for shungiku) each in their own position in the pan. Keep it tidy. Allow to cook for 1-2 min and then add shungiku. It's now time to eat! Everyone takes something from the pan with their chopsticks, dips in raw egg and eats. Keep the pan only just simmering as you enjoy your sukiyaki. When most of the ingredients are gone, add more of each ingredient, pushing the cooked ingredients to one side (still keeping it tidy). Add some more sake and sauce mixture. 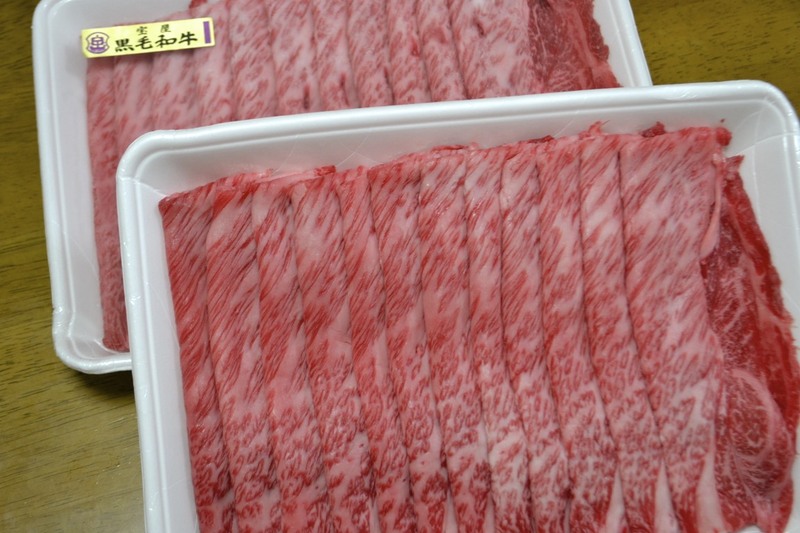 I don't think I've ever eaten such expensive wagyu in my life! 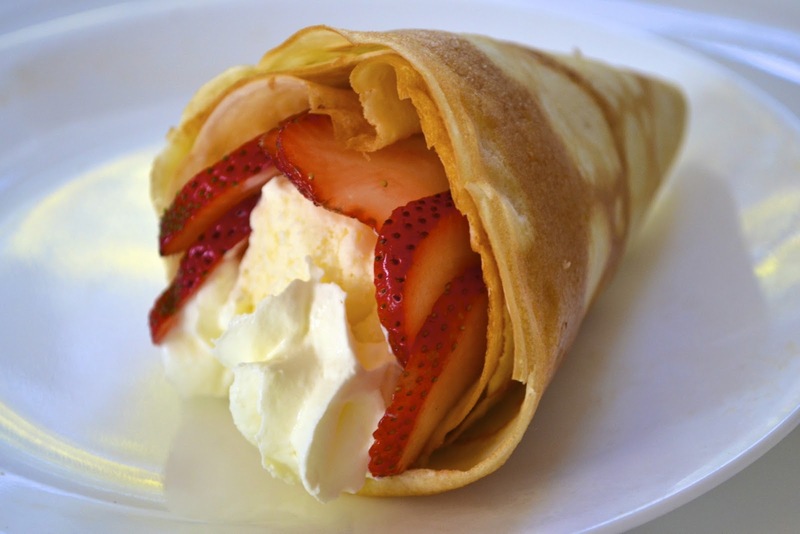 It is so tender it almost melts in your mouth. 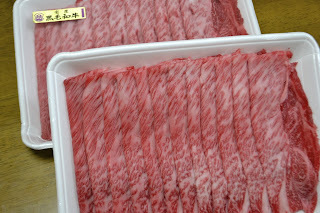 Wagyu is sooo filling, (due to high fat content) this was enough wagyu for maybe 8-10 people. There was just three adults eating... we did NOT eat it all! 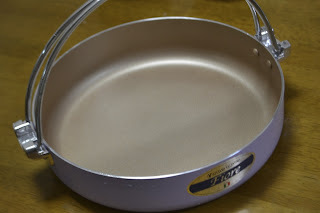 I thought it interesting that the Sukiyaki Pan is made by an Italian company, possibly in Italy?? 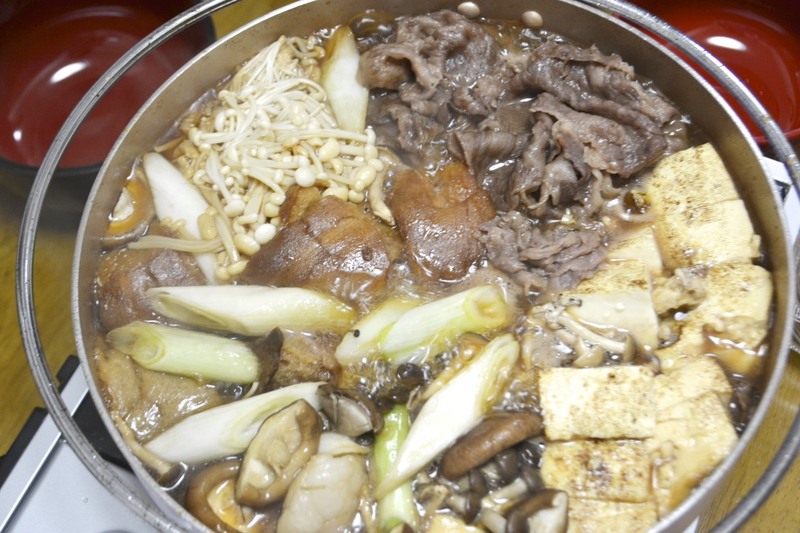 This is my second Sukiyaki Post...I think I must really LOVE SUKIYAKI! By the way, this style of making Sukiyaki is from a friend from Yamagata. So maybe you've seen my recipes, looked at the ingredients list, and thought "what on earth..."? 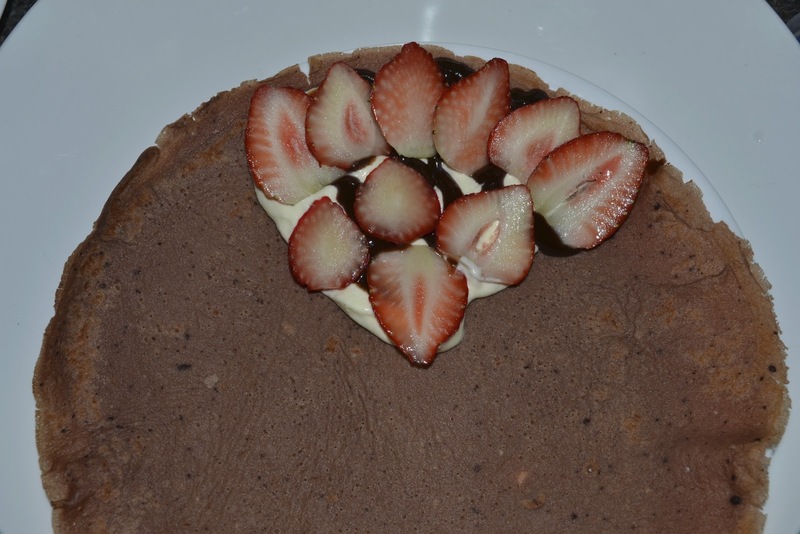 There are a few items I always keep in the cupboard and in the fridge and pantry. 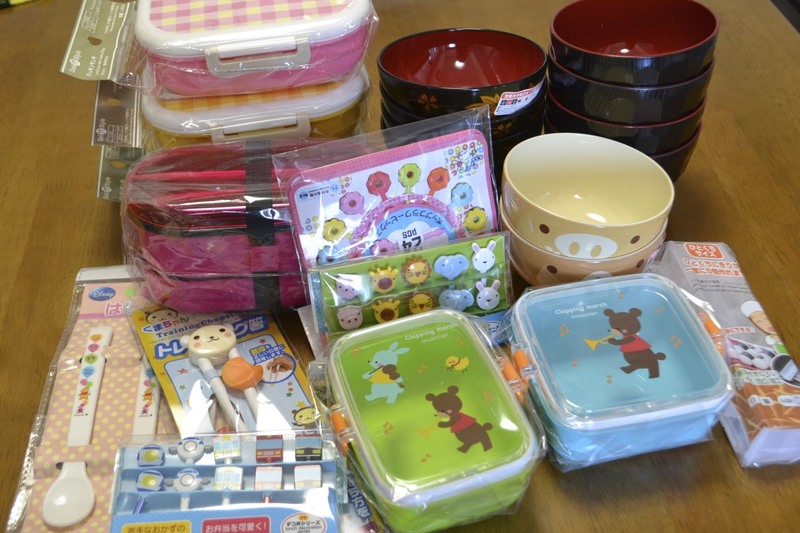 If you have these few items, you'll find you can make many Japanese dishes! Shoyu: Japanese Soy Sauce. Kikkoman is one famous brand. 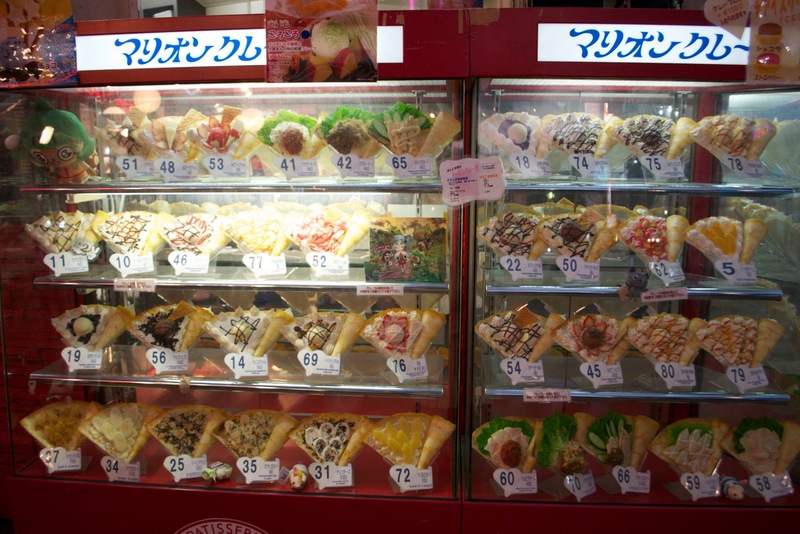 Don't use non-Japanese brands, their taste is different so they can't be substituted. Mirin: Japanese sweet rice wine for cooking. You can substitute 1/3 the volume in sugar if necessary. Dashi: Japanese Fish Stock made from bonito. 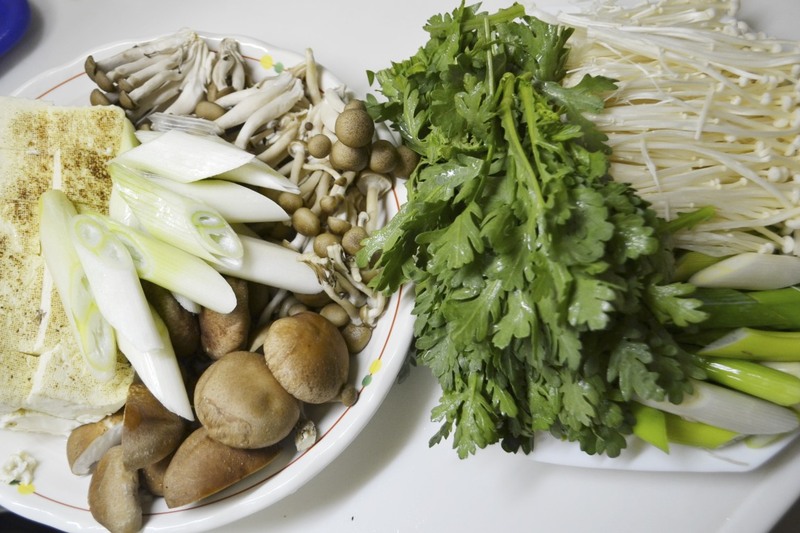 The most convenient forms are stock powder, called Dashi-no-moto or Hon-dashi. 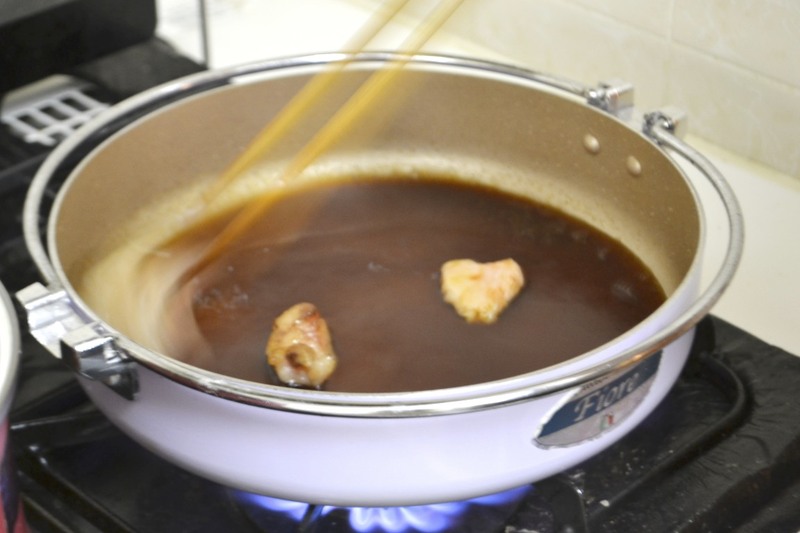 Scroll down below to see the other ways to make Dashi. Tonkatsu Sauce: A condiment for many modern dishes. Made from a unique blend of spices, fruit and vegetables. 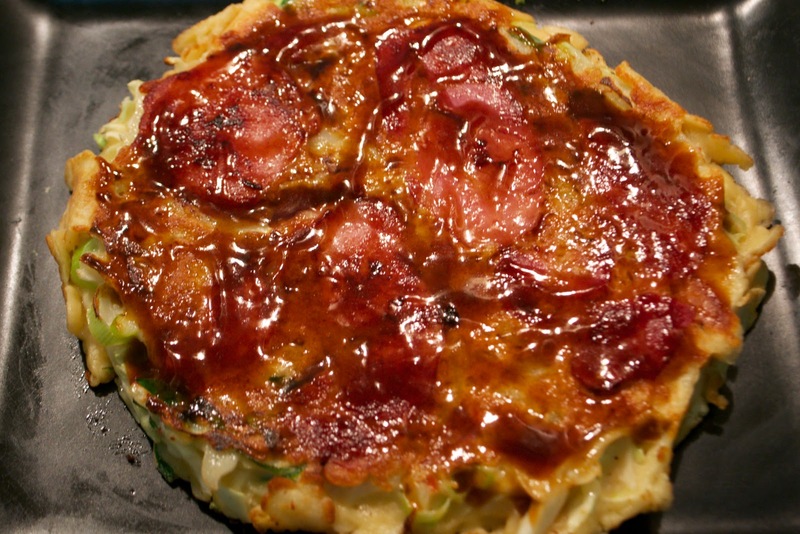 This is very useful as it can also substitute for Okonomi Sauce or Yakisoba Sauce. Japanese Mayonnaise: many brands, pretty much the same. Used in modern Japanese dishes. Miso: Soy bean paste used in Miso soup, Miso ramen, mabo-dofu or mabo-nasu etc. Sake: (Ryouri-shuu) Rice wine for cooking. Can sometimes be omitted if you don't have it. Or replace with water in the case of Yakiniku Sauce Recipe. Sesame Oil: Used in any Chinese-influenced Japanese dishes such as ramen, gyouza. Kombu: Strips of Dried Kelp (seaweed). Naturally enhances flavours. cucumber, pumpkin, spinach, corn, peas, lettuce, tomato, broccoli, avocado. Piiman: In Australia I use Green Capsicum (bell pepper). In Japan real piiman are small with very thin skins. Enoki: White thin mushrooms I buy from the fridge in my asian grocery store. Yes, commercial dashi powder (dashi-no-moto or hon-dashi) does contain MSG. Japanese people have been using it for decades and most have never thought twice about it. 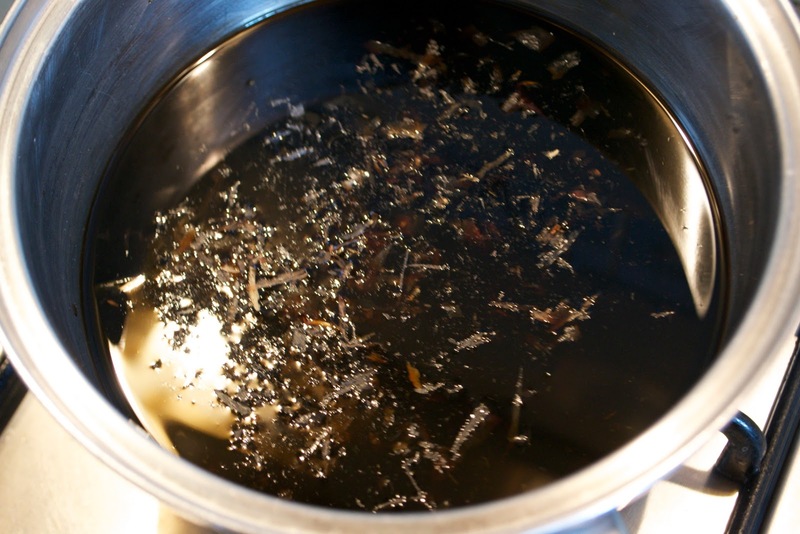 If you want to make it MSG free, then make your own dashi by boiling katsuobushi in water with a little kombu. Kombu has the natural version of MSG so it's a natural flavour enhancer, and katsuobushi is what we're making stock of. There are also dashi bags (like big teabags) which are basically dried katsuo in a teabag. I usually use the dashi powder. It's easier. 3/5/2012 update: For the past month or so I haven't used dashi powder once! Where dashi stock is needed, I begin by boiling the katsuobushi in water, then use a sieve to scoop out the katsuobushi before adding ofther ingredients. 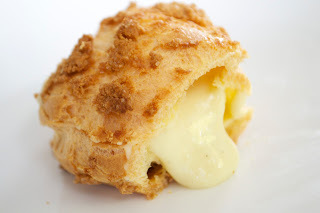 For today's cream puffs I used a REAL pastry bag. (8 for 100yen, from Daiso.) Not a sheet of cooking paper folded into a cone (that's what I've been using until now), but a real piping bag. 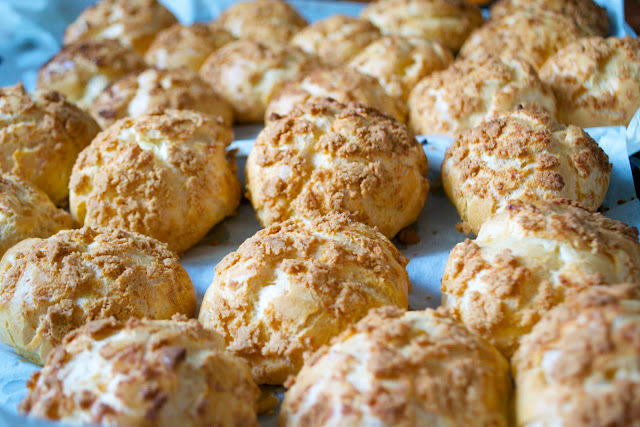 It made such efficient use of the pastry that I made 16 giant cream puffs in one batch. They puffed so big I think I should have made 24 normal sized (big) puffs. "Hooray!! I never win anything!" "i feel so lucky.. i didn't expect to win (but i secretly prayed that i will lol) anyway that is so sweet of you.."
who will be receiving their prize packs in the next few weeks. littlejapanmama.com "Like" to Win Japan Giveaway was drawn using all the Facebook "Like" entries and Google "Followers" at 10pm 5th October 2011, which totaled 50 entries. The draw was conducted by numbering the list of entries and using the www.random.org True Random Number Generator. The five winners have all replied to their notifications so this draw is now closed.